Heat oven to 325°F. Spray 3-quart casserole with cooking spray. Cook and drain tortellini as directed on package. Meanwhile, in 12-inch nonstick skillet, heat 1 tablespoon of the oil over medium-high heat. Cook broccoli, onion and bell pepper in oil about 3 minutes, stirring frequently, until crisp-tender. Remove broccoli mixture from skillet. In same skillet, cook flour and remaining 2 tablespoons oil over low heat, stirring constantly, until smooth. Stir in milk, broth and cumin. Heat to boiling over medium heat, stirring constantly; remove from heat. Stir in chicken, Monterey Jack cheese, tortellini and broccoli mixture. Spoon into casserole. Bake uncovered 25 to 35 minutes, sprinkling with Colby cheese and tortilla chips for last several minutes of baking, until hot in center and cheese is melted. 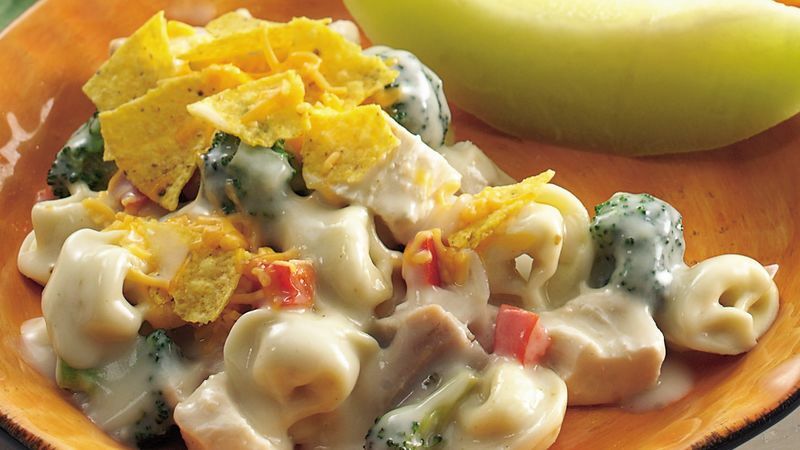 Use broken tortilla chips from the bottom of the bag in this casserole. Or put whole chips in a resealable plastic bag and crush with a rolling pin.